Soap Making Archives - Oh, The Things We'll Make! 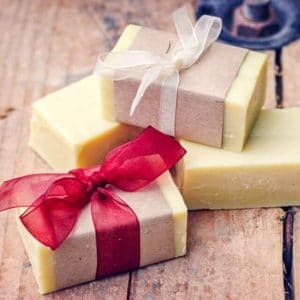 Whether you are new to soap making, or an advanced soap maker, I have recipes and soap making tips and tricks for everybody. If you are new to soap making, I'd suggest you start out with my easy, beginner soap that only uses 2 easy-to-find oils. The post includes safety instructions, tips for customizing your soap with essential oils and/or exfoliants. It also gives you ideas for what to use as soap mold if you aren't ready to invest in them quite yet. For those who want to modify the beginner soap recipe with slightly more advanced techniques, my pumpkin spice soap incorporates goats milk and pumpkin puree into my original recipe, while my gingerbread soap incorporates molasses and spices. If you're ready to delve into the world of making your own liquid Castille soaps, you could try my recipe for a pure liquid Castile soap made with only olive oil, or my liquid coconut oil soap (my favorite)! I also have a popular Glycerin soap recipe for a more translucent bar of soap. What is Lye? Can I Make Soap Without it?